A “Golden Age” of courtly dance and drama was ushered in by Hamengkubuwono VII during the 1920s and 1930s.Much of the sizeable court income from sugar estates was lavished upon massive performances lasting many days and featuring casts of hundreds but a part of it was also devoted to providing a western education for his children. The young Prince Dorodjatun who was to become the next sultan, was sent to live wiyh Dutch families from the age of four, and attended Dutch schools in Yogya, Semarang, and Bandung. Upon Graduation, he was sent to Holland. Where after nine years of study, he reached the final stage of his doctoral studies at Leiden University. Because of the unstable situation in Europe and his father’s failing health. Dorojatun was called back to Yogya in 1939, on arriving in Batavia, he was informed of the Sultan’s intentions to name him as crown prince. The Sultan’s health took a turn for the worse on the trip home, however, and it is said that went they alit from the train a thunderbolt suddenly struck the city from clear, blue skies – an ominous note in the eyes of the Javanese. Hamengkubuwono VIII died the following day. Practical and quick to act, Hamengkubuwono IX assumed responsibility for the day to day administration of his realm in extremely difficult times. Through three and a half years of wartime occupation (1942 – 1945) he steadfastly refused japanese request to send Yogyanese laborers abroad to an almost certain death, insisting that they were needed at home to construc an irrigation canal linking the progo and Opak rivers, Frequent visits incognito to the villages, meanwhile, kept him in touch with the peasants and their deteriorating living conditions. His support of the new Indonesian Republic proved crucial to its survival through four long year of revolution, and his strenght and quite integrity helped steer the young nation thereafter through several decades of social upheaval and economic hardship. He held several ministerial posts, even serving a term as Vice Prisident under Suharto, All the while maintaining an active role as Yogya’s Sultan. Under his rule, palace rituals were simplified but not abolished, and several new dances were added to the palace repertoire. Five months after his death, on march 7 1989, his eldest son was crowned Hamengkubuwono X amidst much pomp and ceremony. The young sultan has inherited not only his father’s throne but also some of his charisma and common sense. 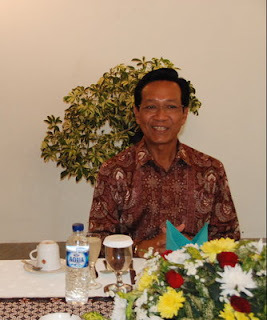 Chairman of the local chamber of commerce and a member of the national legislature, the new sultan is a popular figure who is very much aware of his dual role as preserver of Yogya’s traditional culture and pioneer of the city’s future. 1. http://novavilla.wordpress.com/ dan http://villanova32.blogspot.com/ untuk informasi villa dan penginapan sederhana yang Insya Allah barokah. Serta product minuman Sari Apel Jawara yang tiada bandingan lezatnya……. 2. http://villanova32.multiply.com/ untuk informasi Villa Nova Songgoriti dan product serta wisata-wisata menarik seputar Malang Raya. 3. http://centralindustriagro.wordpress.com/ untuk informasi minuman Sari Buah Pepino, Naga dan Mengkudu Laos. Mengajak Anda menjadi distributor, agen, maupun pengecer di seluruh kota se-Indonesia.